A blog reader recently contacted me about the oddity that most of us know as the unmade section at the top of Green Lane. "The Green Lane School car park is starting to annoy me and many other people. It truly is a misery, and my car has suffered enough. 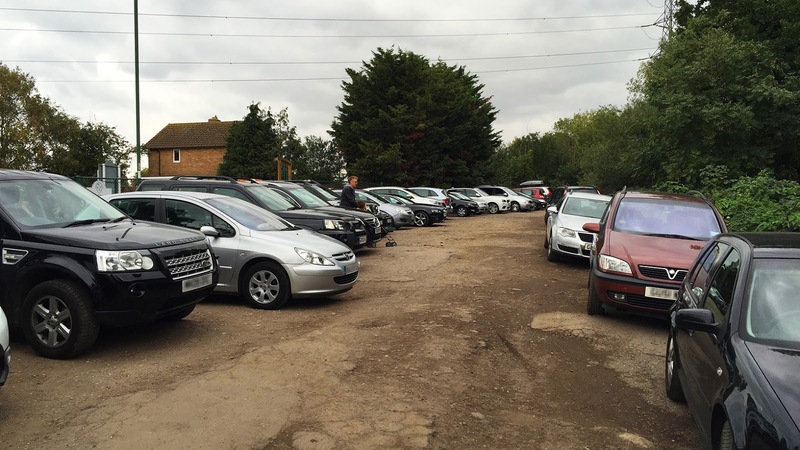 The whole parking area is very neglected, and will get worse with this Winter's weather. 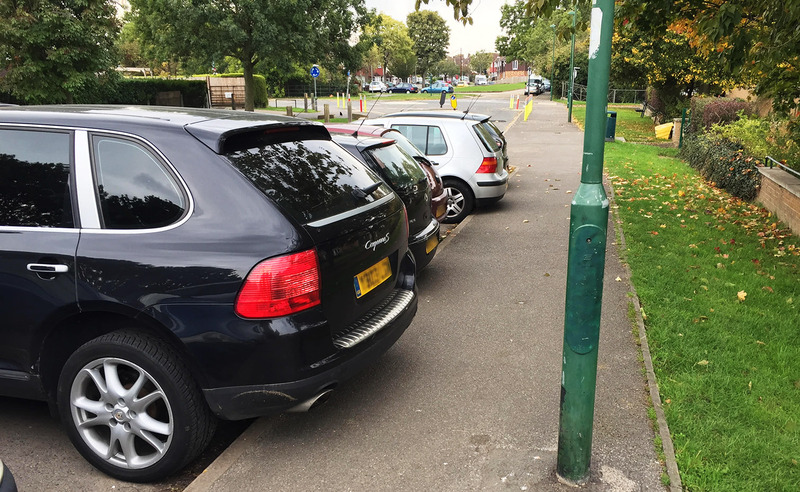 Another main problem apart from surface, is the lack of bollards or railings to prevent cars from reversing over the pathway. There was a serious near miss when a car careered out of control a few weeks ago, through the hedge and into the Hamptons' fence. If it was the other direction - it would have gone through the children (it was pick up time) standing on the path and through the school wall / fence. It's all an accident waiting to happen, and it is not acceptable to wait until that accident happens, before anything is done about it. The sheer volume of cars coming in and out throughout the day (see pics) is a concern. Particularly with cars swerving to avoid grounding their cars. I'm considering buying a Land Rover to prevent this happening again. It's also treated as a storage car park for the local mechanic's garage, and overflow parking from the Hamptons - which simply adds to the volume and parking chaos. My concern is why is this neglected - from a duty of care perspective from either council. Local council should not be allowed to wash their hands of this because it is convenient to their financial budgets to do so. At the expense of child safety and general duty to council tax paying residents. Why are they putting the local community at risk and avoiding their duty of care to the school and it's children? I'd have thought safety was a prime concern. It took a serious amount of campaigning to get the 'yellow and orange pencil bollards' put in by the roundabout." 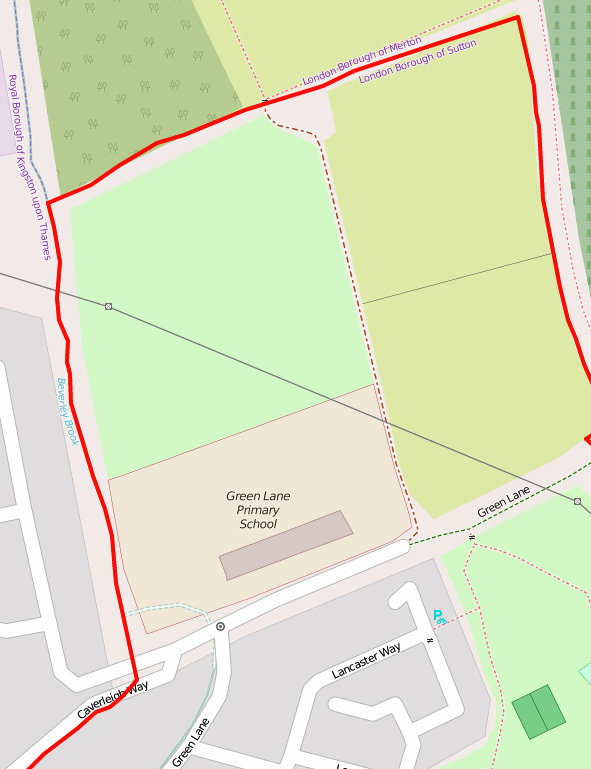 Whilst Green Lane Primary School is a Royal Borough Of Kingston School, situated within the bounds of the London Borough of Sutton, the land surrounding the school on all sides is completely within the Sutton boundary. There is only a thin piece of land between the western side of the school property and the Beverley Brook which marks the actual boundary with RB Kingston but everything here is Sutton's responsibility other than the running of the school. The unmade section of road is unadopted land which is not owned by the council. Technically it belongs to someone but no one seems to know who that someone is. But as it doesn't belong to the council, the council are not required to maintain it. I understand there are processes councils can go through to adopt such pieces of road but I suspect that doing so will make them responsible for it, requiring them to pay for it to be fixed and therefore cost money they don't want to spend. It is probably easier to just claim it's someone else's problem. The council did reluctantly spend some money in this area when shamed into it by the late and fondly remembered Ray Bunce who campaigned for children's safety here for many years. He is remembered with a bench dedicated to him outside the school. Ray raised many thousands of pounds and eventually made some progress when the council agreed to the new pencil themed bollards outside the school. However even at those local committee meetings (which I attended) councillors were talking about the road not being theirs and so they couldn't justify spending money on it - in case the real owner then turned up and took it over again. I must stress at this point that I'm not a solicitor and don't have access to council officers or files like councillors do and so I don't know exactly how much it would cost to adopt the land and then fix it. I can't help feeling though that the council owe a certain duty of care to people going about their business in public spaces within it's boundary and that fixing this problem should fall within that remit. I also feel that the liklyhood of the real owner turning up is vanishingly small and the risk is worth it - for the sake of the children.